Deerfield is a town in Rockingham County, New Hampshire, United States. The population was 4,280 at the 2010 census. Deerfield is home to the annual Deerfield Fair. At the 2000 census, there were 3,678 people, 1,225 households and 986 families residing in the town. The population density was 72.2 per square mile (27.9/km²). There were 1,406 housing units at an average density of 27.6 per square mile (10.7/km²). The racial makeup of the town was 98.53% White, 0.16% African American, 0.14% Native American, 0.14% Asian, 0.22% from other races, and 0.82% from two or more races. Hispanic or Latino of any race were 0.30% of the population. There were 1,225 households of which 43.3% had children under the age of 18 living with them, 71.0% were married couples living together, 5.3% had a female householder with no husband present, and 19.5% were non-families. 12.9% of all households were made up of individuals and 3.8% had someone living alone who was 65 years of age or older. The average household size was 2.98 and the average family size was 3.27. Age distribution was 30.0% under the age of 18, 5.2% from 18 to 24, 33.0% from 25 to 44, 24.9% from 45 to 64, and 6.9% who were 65 years of age or older. The median age was 36 years. For every 100 females, there were 95.8 males. For every 100 females age 18 and over, there were 97.1 males. The median household income was $61,367, and the median family income was $64,737. Males had a median income of $40,568 versus $30,682 for females. The per capita income for the town was $24,160. About 1.3% of families and 3.2% of the population were below the poverty line, including 1.0% of those under age 18 and 10.4% of those age 65 or over. There is one public school in Deerfield, the Deerfield Community School on North Road, which serves students in grades P-8. The current principal is Chris Smith. Deerfield Community School was opened in 1990 and replaced the George B. White School. The George B. White Building now serves as commercial space and houses, among other things, the town offices and the police department. Deerfield students have attended various local high schools over the years, as there is no high school in the town. Starting with the DCS graduating class of 1995, the town has sent students graduating from Deerfield Community School to Concord High School. Other options have included Coe-Brown Northwood Academy in Northwood, Central High School in Manchester, West High School in Manchester, Pembroke Academy in Pembroke, and Oyster River High School in Durham. The students graduating from Deerfield community school still continue to go to Concord high unless given opportunities to go to other schools. 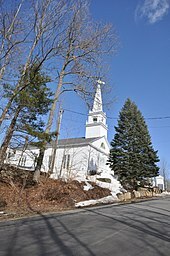 Wikimedia Commons has media related to Deerfield, New Hampshire. ^ "BUTLER, Benjamin Franklin, (1818 - 1893)". Biographical Directory of the United States Congress. Retrieved November 20, 2013. ^ "Term: Harvey, Lorenzo Dow 1848 - 1922". Wisconsin Historical Society. Retrieved November 19, 2013. This page was last edited on 3 January 2019, at 19:53 (UTC).